Sherry has risen to prominence in the cocktail bar in recent years, and bartenders are starting to look beyond style and towards brand. Tío Pepe, the iconic fino brand at under £10 a bottle, is a no-brainer for bartenders looking for a drier style. Indeed, 39% polled said it was their number one sherry and 65% put it in their top three. It’s owned by Gonzalez Byass, which is the name of the umbrella group but also a line of sherries and takes third spot in our list. Gonzalez Byass’ self-titled range includes sub-brands Vina (an Amontillado), Alfonso (an Oloroso) and Nectar (a Pedro Ximinez). The range tends to be occasional-use products and 28% said they are among their top three sherry brands. 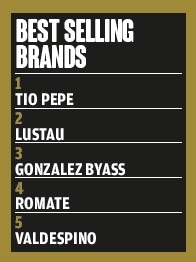 In the Top Trending list, Tío Pepe dominates, which shows that, in the midst of renaissance, the big brands still carry an air of novelty.